jb MKP, JFLM with Small Dimensions and the Pitch is ONLY 5mm! After your memorable summer holidays, you may come back to work in September. jb prepare some promotion programs for you to welcome your returning. At this moment, we have some new products series with competitive price. Its epoxy coating, which have high reliability because of its excellent Self-Healing performance. It is also recommended for high-frequency circuits like s-curve compensating circuit. The dissipation factor of JFLM is normally low and it is stable to against high frequency and change of temperature. 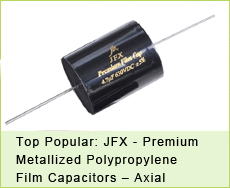 Except for above JFLM, lots of our capacitors also have special offer. You will receive the most favorable price information! Capacitors seems to be normally yet indeed plays an important role in many audio equipment. 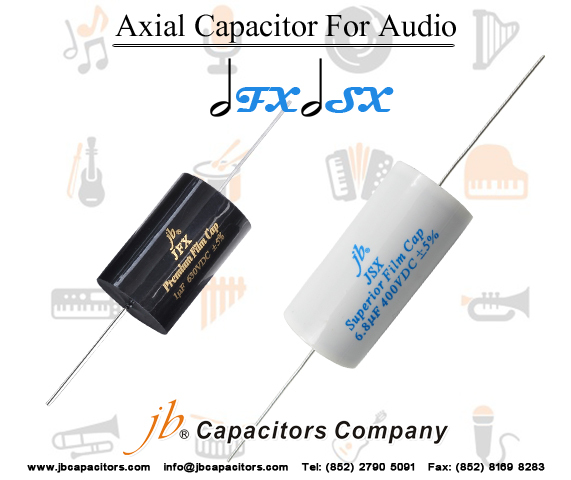 A very good quality of capacitors can help you to deliver the most pureness touching voice, and real feeling. Not satisfying with your current use capacitors? JFX.JSX are strong series in jb, designed for provide perfect sound quality and use excellent handling of high current audio pulses. It can deliveries to you perfect sound performance for sure! We are not only provide competitive prices also make sure high sound quality. what are you waiting for? Welcome to send us your exact inquiry or ask for FREE SAMPLES! After years of study, jb finally successfully developed a new series of capacitors for capacitive divider. 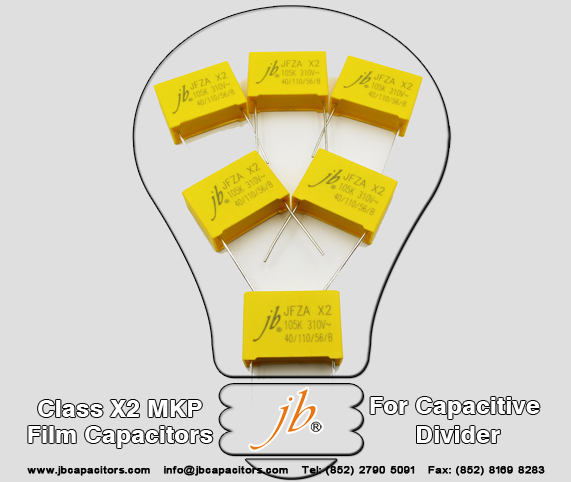 X2 capacitors are used not only for EMI suppression, after upgraded, they are also suitable for voltage dividers in capacitive power supplies – for example, those of smart energy meters. 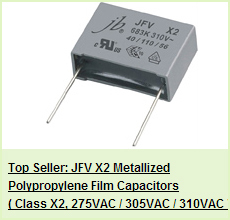 This kind of capacitor is specifically designed for applications in serial with the 100~240Vac MAIN. thermostat, replace the transformer. Also widely used in LC resonant, high frequency high current situation. 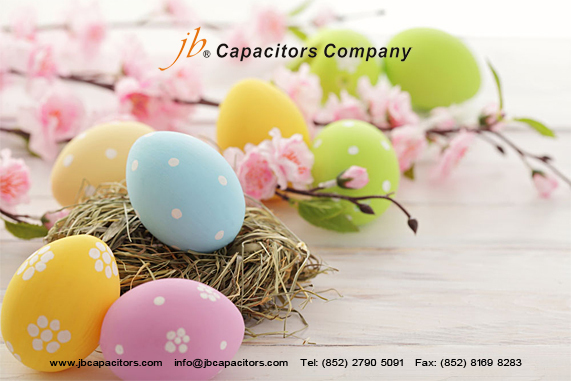 As capacitor voltage divider in applications requiring a high capacitance stability over time, we highly suggest you to use jb new designed capacitors, specifically designed for applications in serial with the 100~240Vac main. High Capacitance stability for harsh environment. Relevant for capacitive divider power supply, power meter, emergency lighting, thermostat, interference suppression. 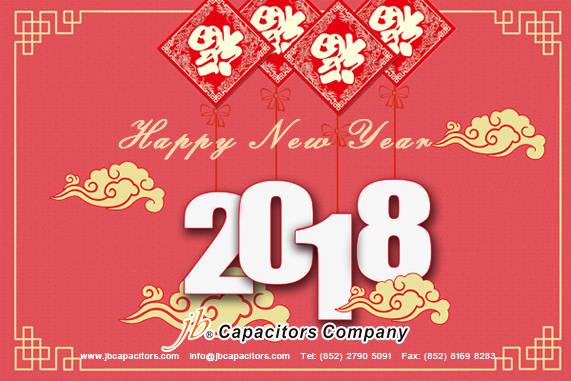 jb Capacitors Team Wish You Merry Christmas & Happy New Year! 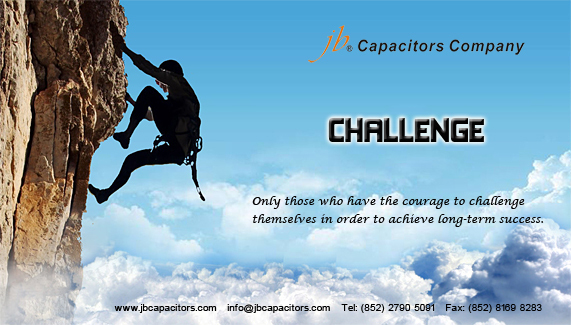 All jb capacitors team wish you a Merry Christmas and a Happy New Year. 2017 was a very successful and amazing year! Thank you for your support, cooperation and friendliness. We hope the coming 2018 will be much more interesting with a lot of opportunities for our cooperations! Easter is the anniversary of the Resurrection of Jesus Christ. It celebrated on a Sunday between the dates of March 22 and April 25. Easter is ready to come, do you have plan on that day? Many people celebrate Easter by buying new clothes. Children celebrate by hunting for colored eggs that their parents have hidden around the house. People also give Easter baskets filled with candy and other goodies to one another to celebrate the day. But the holiday is more than new clothes and good things to eat. On Easter, many people go to church to celebrate Jesus' resurrection from the dead. The spirit of Easter is all about Hope, Love and New Beginning. Happy Easter! Today we would like to share you below Famous Celebrities, hope they'll be useful for your life, even works. 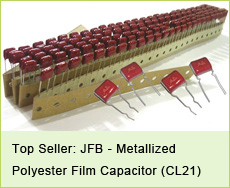 jb Metallized Polypropylene Film Capacitors JFL series with epoxy coating, have high reliability and excellent Self-Healing performance. We have high quality commitment, fast lead time and the best price in the market. Any questions about products, please feel free to contact us. Non-inductive, epoxy dip coated, high moisture resistance. Dissipation factor is normally low and it is stable against high frequency and change of temperature. Recommended for high-frequency circuits like s-curve compensating circuit. High reliability because of its excellent Self-Healing performance. The main properties are Non-polar, high insulation resistance, excellent frequency characteristic (broad frequency response), and the dielectric loss is very small. 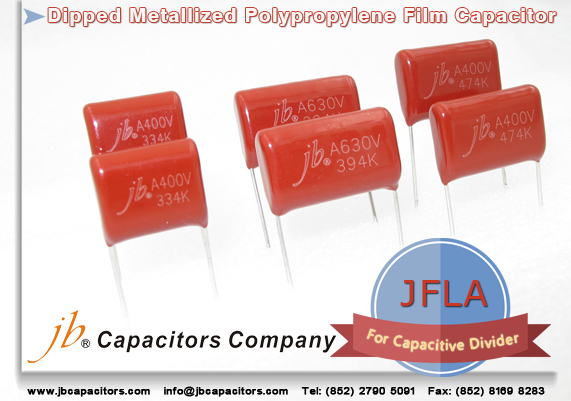 Based on the above advantages, film capacitors are widely used in analog circuit. Especially in signal coupling part, you must use good frequency characteristic and low dielectric loss of capacitor, to ensure that the signal transmission, when does not have the too big distortion occurs. Among all of plastic film capacitors, the most significant is polypropylene (PP) and polystyrene (PS) characteristics of the capacitance. Film capacitors' manufacturing method usually is the aluminum foil, as the electrode and the plastic film after overlapping winding together. 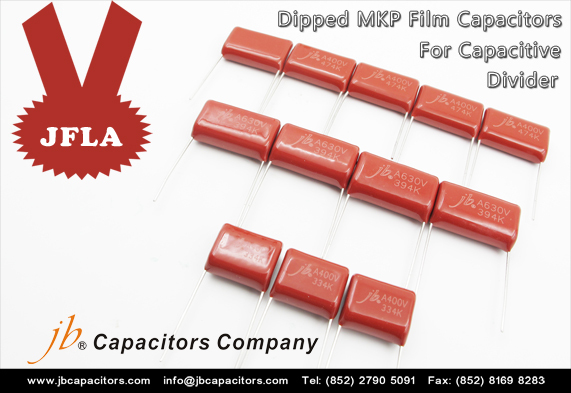 But film capacitors have another manufacturing method, called Metallized film (Metallized Film), the method is in plastic film in vacuum evaporation of a very thin layer of metal as electrode. So you can save the thickness of the electrode foil, reducing the size of the capacitor unit volume. 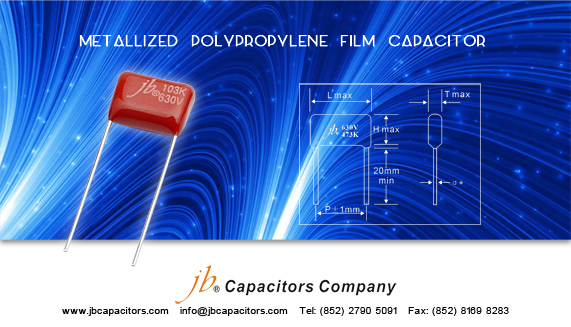 It is easy to make film capacitors small, it can make large capacity also.